One of the first people I began a virtual relationship within the twitter land of foodies, was Zoe Francois, of Artisan Bread in 5 Minutes a Day & Zoe Bakes. Zoe and I instantly connected – I loved her witty comments, the warmth of her personality that came through the screen and the passion she writes with about baking, her family and what she does – that was a couple years ago. After the foundation was built, I came to know and love Artisan Bread in 5 Minutes a Day. I loved that I could make fresh bread easily and not once a week but every day! When I heard of her new book that she was co-writing with Jeff Herzberg, I was equally as excited. I immediately thought of Celia over at Omnivore Books and knew I had to virtually introduce them, Healthy Bread in Five Minutes a Day, had to make an appearance. Zoe and Jeff made their appearance at Omnivore Books back in November and we had the honor of capturing the event live so that we could (they could) share it will you. They filled the room with people who all loved the same things we love about them – insightful knowledge about baking, witty humor, warm personalities and a passion about baking that was very evident! When I had Zoe off camera I had a chance to talk to her about the dilemma we have at our house. The one about how a baguette never makes it past a day, yes, the same one where I have to hide them or it will be gone before dinner and if I want even a bit of bread with dinner, I have to tear off a chunk or it will be gone before I barely sit down! I continued to tell her that I had to stop feeding this expensive habit of a certain someone as we were spending between $40 – $50 a month, just on baguettes! When I asked her if she had figured out the cost per baguette by using their method and she told approximately .40 per baguette, I was sold! Now I have yet to make the master recipe and start cranking out freshly baked baguettes for our meals; but, I have tried one of their roll recipes, 100% Whole Grain Rosemary Potato Dinner Rolls with a Salt Crust. I did have to improvise a bit as we were traveling in the middle of nowhere when I attempted to find the ingredients; I could not find rye or soy flour so I used half white and wheat. Other changes I made was adding the rosemary into the dough and I omitted the salt crust. I am happy to say, the recipe came out perfectly and was incredibly easy and very delicious! I have to say I am loving the recipes I have read so far and am very eager to start baking not just one but many of them. Zoe and Jeff have everything some savory to sweet and from everyday bread to enriched bread and pastries. As well all of the recipes look easy enough for the novice baker to get their hands dirty with, we highly recommend this for your kitchen bookshelves! Now for some exciting news. Zoe has been so kind to offer one of our readers a signed copy of their newest book! Just leave a comment, by midnight, January 15th, 2010, telling us how baking fresh healthy bread in 5 minutes a day would change your life! If you would like an extra chance, then twitter this post and leave a comment with your tweet. We are even sweetening the deal, you can tweet this once a day, just be sure to come back and post your comment w/the tweet in it! Do you want the recipe? Then you need to go here. Or wait and see if you win the book! 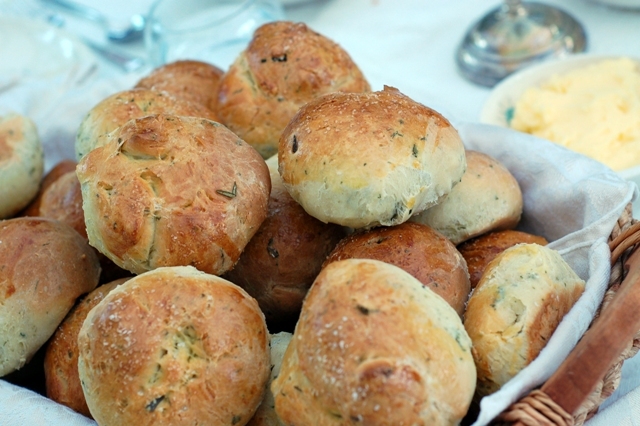 54 Responses to "Rosemary Scented Dinner Rolls"
I have the ABin5 book and I love it. I've had it since last summer, and ever since then I've always had a batch of the basic dough in my refrigerator. I don't think I've bought a loaf of French bread or a baguette in over 6 months. I'd love to win the new book because I know it has some gluten free recipes and I'd like to try them for a family member who cannot eat gluten. I would love fresh bread daily! I would love knowing that I was eating all natural food! I have their first book and have baked countless loaves of bread in the last 12 months. My family loves homemade bread and eat up everything I make (okay, almost everything). By baking my own bread, I know exactly what is in my bread and what isn't. I would love to win their newest book and can't wait to try some of their new recipes. Loved the video, thanks for sharing. I'm excited to try the HBin5 recipes...we buy a lot of bread in our household, but making our own that is healthy, easy, accessible and baked fresh daily would be amazing! I would LOVE to win this book! Bread is on my list of things to get better at making this year! I own both copies of Zoe and Jeff's books and love them ! I'd love to win a signed copy ... I'm a huge fan ... and love baking my own bread every other day or so. This looks like a great book, I love baking bread and often resort to my breadmaking machine. thanks! OK, I'm dying to see this book. I rarely bake bread due to lack of time but would love an alternative to store bought bread! how wouldn't a book on making bread in 5 mins a day not improve my life? first off, it would save me time. obviously you say. but not just time like i need to have a good bread with dinner. i'm talking about not spending my ENTIRE weekend,(ok maybe just one weekday) rising and kneading, rising and punching, rising and punching. then kneading, then kneading.... than rising. all this for about 10 mins of eating the bread. it doesn't not take long for two hungry bread lovers to polish of a loaf. but not only will it save me time, it will be a healthy improvement to my life. i didn't say diet because i'll eat bread no matter whow much i weigh. but i mean healthy as in, instead of baking bread on Sunday i could be in my saddle riding the beautiful hills of Marin county. Instead of rising and kneading on Saturday, i could be running and leading (routes that is, at the local climbing gym.) You know what i'm talking about... the decision on Tuesday night after work, "i'm feeling lazy but i really need to work out. but if i stay home, i can at least try a new bread recipe." then 10pm hits and your tired and the bread has 10mins left in the oven. so you take it out just as the buzzer rings, throw some butter on it while its still piping hot. Next thing you know you have to brush your teeth because its almost 10:30 and you need to get in bed. (there is nothing wring with going to bed at a reasonable hour) and can i say (hopefully i'm not alone in this) but did you ever get so excited about making bread for the first time that you literally could not sleep? i was seriously awake at midnight over-excited about my first bread. i had visions of my great aunt and her yellow glass bread bowl, and her giant wood rolling board. i would help her make cinnamon rolls, every saturday, the slick of the oil on the newly risen warm dough ball. i thought/dreamt how proud she would be, and where could i get a yellow bowl like that at this hour? lastly, as much as i adore my new found love "The Tassajara bread book", which i bought two years ago and just recently cracked open, i wouldn't minding trying something a little more edgy. The Tassajara bread book is great, but it put a little fear into my heart when i was worried about putting Rosemary into the basic bread dough without being told it was ok. I'm such a sucker for Rosemary olive oil bread, or Rosemary potato bread, and the thought of putting all that effort and high hopes into being able to create my own to support my Rosemary habit, only to be left disappointed because i tried to change a Tassajara bread recipe!? i can't handle that kind of pressure. so, not that i unloaded my last two weeks of bread obsession on this innocent comments board, i ask simply, give me a chance at winning the book. i promise, i'll make bread and share with everyone at the gym. My friend Araxi told me about this book and I immediately put it on my Amazon wish list. Hint hint Mom! :) I have been baking sourdough for a year and a half but have not been able to get the crust "crusty" enough for my taste. I think this book would help me push through to the next level and inspire me to try a few new recipes as well! These rolls look delicious! I'm actually on a quest this year to bake more bread. I've been a little hesitant to try it for fear of screwing it up. I think this book would definitely help me get over my fears of baking bread. I've been learning about bread baking and working with a sourdough starter for about a year. Now, I'm intersted in learning the five minutes a day approach. Your rolls look fantastic! If I baked my own bread, I'd be getting more fiber, so I'd worry less about colon cancer. Which means less worry lines. Which means I'd look younger, which means Id feel better, which means I'd be close to nirvana. So really, Zoe's book could save my soul. Hyperbole? Making Healthy bread would just be a great addition to the breads I already make by making them better for us. Only started making bread by hand a few months ago and ABin5 was one of the first books I used. Now I need HBin5. Just tweeted about this great give-a-way. oh! I would save SO much money baking my own bread! I have recently been experimenting with the master recipe and am still workign kinks out. The book would probably help, huh? Your website looks great, especially today's rolls...I just ordered the ABin5 book and can't wait to get it!! I have a confession, I got both of the books for Christmas and have become a bread baking maniac. And loving it all. I would love to have a signed copy and then I would pass on my book to my daughter. I have tried many of the different recipes. At this time I have the master white boule in my fridge and a seeded oatmeal bread. I love knowing what goes into my bread. How it would change my day? I think I'd better tell you it would affect 3 teenage boys... they love french bread and never stop asking when do I make more. Frankly I'm so proud of my baguettes that I hate to see them eaten up so quickly that there is no time to enjoy their crispy appearance. So... able to make this 3 times a week? I'm in! I recently received ABin5 as a gift, and have become an immediate fan! I love bakery bread but the cost out of control these days. I also love to bake, but with two small kids, I don't have the time it would take to bake my own the traditional way once a week, let alone daily. ABin5 completely changed that! My only "complaint" about the book has been how much white flour is involved in the recipes - I have ulcerative colitis and somewhat depend on the fiber in whole grain products - so I was thrilled to learn about HBin5. It's already on my Amazon wish list, but how exciting would it be to win a copy?!? I have their first book and have made several batches. Delicious and easy! Baking bread isn't as much of a choir and process as it was before and people are really impressed with fresh baked goods! If I had their 2nd book, eating the fresh bread daily would be more healthy for me and I would really like that. Thanks for offering the giveaway! Hello, I've been trying out one of the ABin5 recipes I found online and have been making my own bread for 3 weeks. My family loves it and I would love to try out some from the new book. This is a fantastic giveaway! I have their first book and love it, but I would really love to be able to make healthier breads for my family! Bring on the whole grains! I love baking bread and the first book made it so easy. I would love to expand and make more whole grain breads. I run a school lunch program and teach a cooking class. I am going to teach the students to make bread, and play with all kinds of whole grains. Start them young! I would love to teach them from both books! I have already purchased this book, would love to win so I could donate the book to our public library. One of my goals is to teach this to as many people as possible. Would love this book, I've been trying to get more whole grains in my family! I love bread and to get recipes of healthy breads will be great. I would love to try them. I would love this book!!!! I love baking and need to start baking some healthier things for my family. My breadmaker broke so I'm looking for some new ideas to branch out with my breadmaking! This sounds wonderful...I have rosemary growing in my yard year round and will have to try this one! Yes, enter me in the drawing also please! OH MY GOD! thank you so much! you guys are the best! thank you thank you!